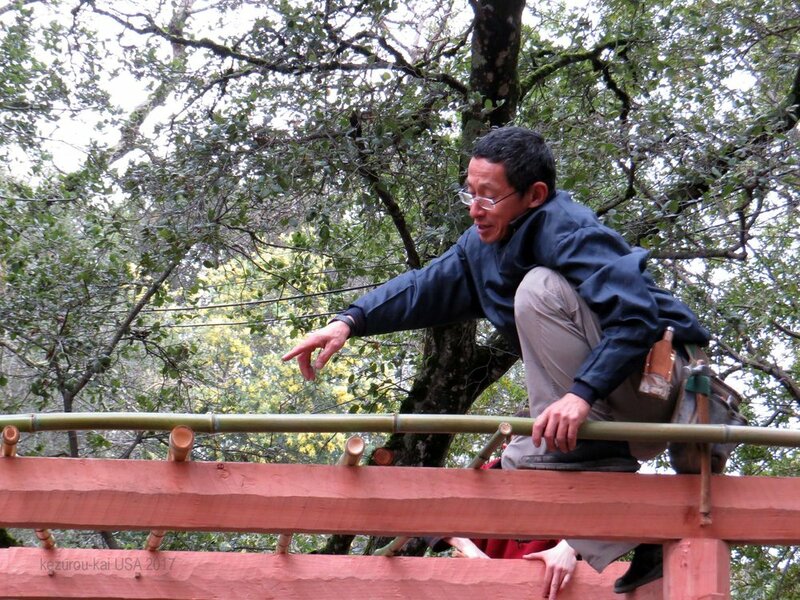 As you may recall from the Kezurou-kai last October, there was work taking place throughout the day on a redwood arbor that was to be installed at Hakone Gardens at a later date. Well that later date was February 18 – a rare day with no rain and no mudslides. Karl Bareis and Ryosei Kaneko were the leaders for the day, with Hakone’s Jacob Kellner directing the cutting of bamboo and making sure the team had any resources required. Our volunteer crew arrived at HG before 10am and was soon put to work organizing the work area, unloading Karl’s truck, and preparing the footings. Prior to the 18th, a level area had been selected and prepared for the arbor. 6 fiber-tube poured concrete footings with primed steel brackets protruding from them were ready to go. The blades of these brackets were to insert into (carefully!) chain-sawed mortises in the base of each post and therefore were to be invisible. Securing each post to a bracket would be two heavy steel pins. First order of business was to trim the corners off the square bracket plates so they matched the outline of the octagonal posts that Hata-san had shaped and surfaced for us back in October. The rest of the arbor was all pinned mortise and tenon (MT) joinery that Ryosei assured us was going to provide plenty of rigidity to support any eventual load on the structure. His choice of wood for the pins and spline tenons was elm. The wedges holding the through-mortises are Port Orford cedar. There was still some planing and mortising to be done to prepare the parts for assembly, so the volunteers worked on that while the grinding was happening. 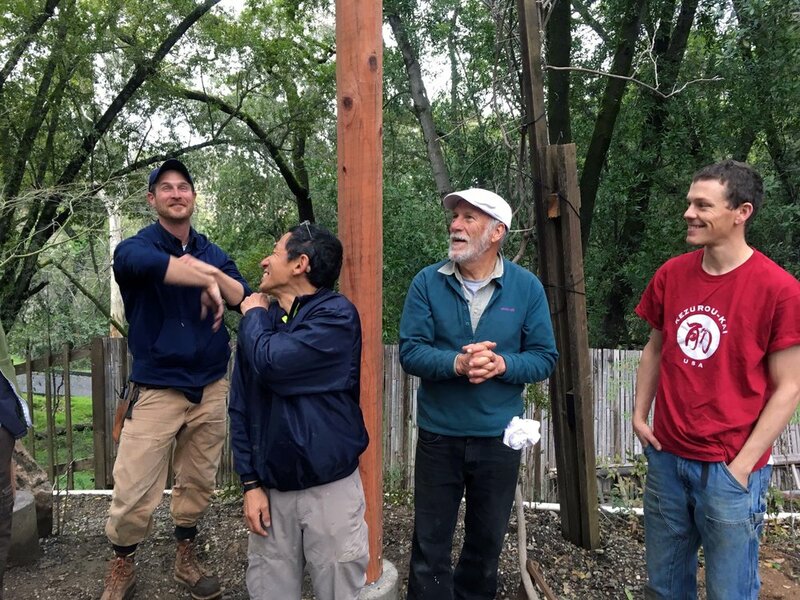 Once the various beams were ready, the crew started by assembling one of the two “sides” of the arbor – basically three posts connected with two beams (hari). You will recall the design called for 6 posts, 3 per “side”, and 3 cross beams. The joinery was tight fitting by design, so for the sides Ryosei broke out heavy ratchet straps to pull the end posts toward the middle to seat the MT and spline tenon (yatoi hozo tsugi) joints. These straps stayed in place until the assembly of the entire arbor was finished. They also gave Ryosei something to swing on. So while the side frames were being assembled a pinned, a few of us, under the leadership of Jacob Kellner of HG, hiked up to the bamboo grove above the parking lot. Jacob’s preferred tool for felling large bamboo is a battery powered sawzall. Very quick. However, to get the clean finished cuts we wanted on the arbor trellis, Jacob introduced us to his Z-saw bamboo saws. The teeth look like short crosscut teeth. They are short so the teeth are less likely to break off on the hard bamboo. They sever the fibrous bamboo well and leave a good finish. To go with the saws was a brief tutorial in delimbing bamboo and then cross-cutting it so as not to have massive splintering and tearing of the fibers. Two additional tips have a major impact on appearances and longevity of the installed bamboo: 1) cut off close to nodes (prevents water collection), and 2) clean the cut bamboo carefully. Jacob and Karl went back to cutting and hauling while others delimbed and cut to defined lengths. Lunch time arrived and everyone convened at the Lower House (1922) for a BYO lunch. An appreciative Mr. Shozo Kagoshima, Executive Director of the Hakone Foundation, joined us and recounted the 100 year history of Hakone Gardens and did a Q&A session while we ate. After cleaning up, Karl and Jacob led a tour to the Upper House (1917) and garden. Last stop was the azumaya near the tea garden of the Lower House. This structure is in need of attention but is still used as the machiai (waiting area) for the tea ceremonies held regularly in the Lower House. Then it was back to work. The bamboo team resumed after lunch and eventually prepared enough to make the lattice, with some to spare. This was carried down to the arbor site and set aside while all hands focused on completing the assembly. Standing up the 2 side assemblies took two people on each post to lift and guide the base onto the bracket, and others working at the top to steady it. First step was to get all three posts resting on the brackets and then simultaneously move the posts so they would now drop onto the bracket. “Drop” is a relative term in this case. While some of the posts did drop easily onto the brackets others had to be coaxed with the large mallet and more ratchet straps. The rigid side assembly had to be eased down at the same rate on all 3 brackets, so it took some coordination, but eventually all three posts were seated. The side assemblies were able to stand on their own once they were fully seated on the brackets, so temporary braces and stays were not needed. Next came the three heavy cross beams (hari) to tie the sides to each other and form the base for the bamboo trellis that would sit on top. 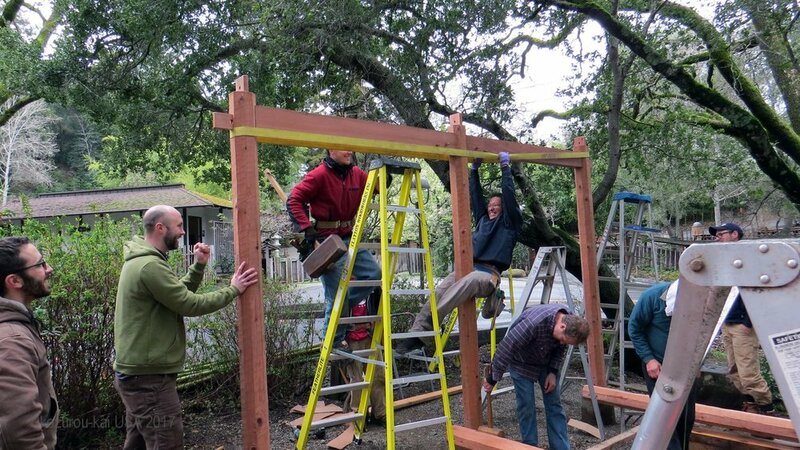 Several volunteers were needed to raise, position, and seat the beams onto the post tenons. Starting at the rear of the arbor we worked forward until the last stubborn beam was seated. Once all were in final position they were pinned in place top and bottom. Last to go on were the 10 longer bamboo pieces that ran front to back. It was decided that these would be held onto the 3 cross beams with decking screws. The bamboo has to be pre-drilled and the screws cannot be over-tightened or the bamboo will split. The tying down of the bamboo cross pieces with palm fiber rope would be done by Jacob Kellner at a later date. Jacob demonstrated the knot tying technique for us and it was one that would require some practice. Tying 100 knots atop the arbor promised to be a challenging task, even for experienced hands. And so we left it, each of us packing up and heading out in different directions. 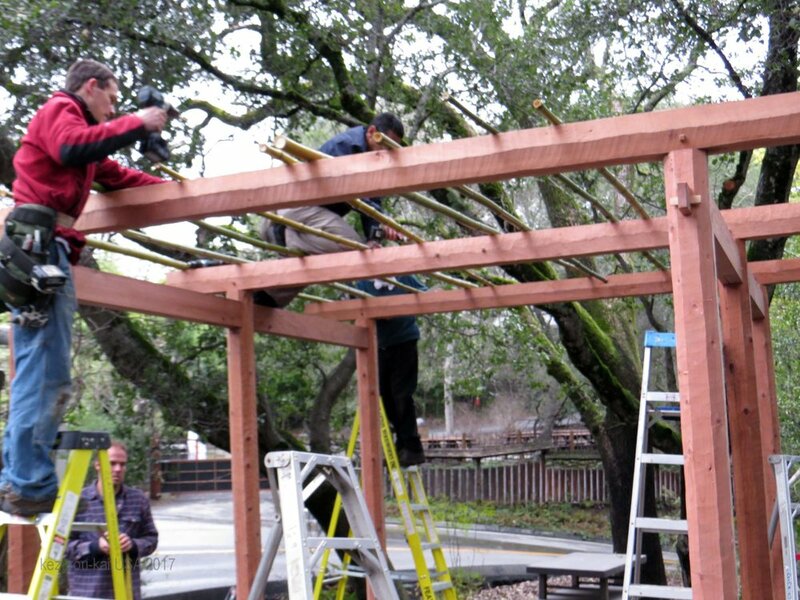 Our volunteers hopefully a little wiser, our sponsors satisfied with the result, and Hakone Gardens ready to take ownership of an inspiring arbor that will provide a respite for visitors and years of service. 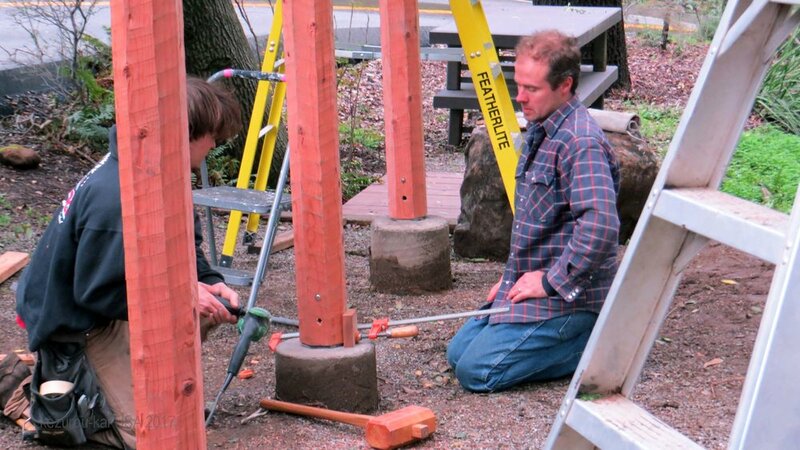 Karl Bareis: the redwood, transport, and for generously providing labor, materials, and time. Ryosei Kaneko: the design, model, layout, labor, and leadership throughout the project. Norio Hata: all hewing and chona work that resulted in the form and finish of the arbor. Hakone Gardens and Jacob Kellner: for supporting the project in many ways, from conception to finish. Lastly, many thanks to those of you that volunteered your valuable time, skill, and effort to be a part of this project.